The following has been compiled from notes on a discussion between Rev Mbeza and the Blantyre Synod website editor. It is not word for word but the content and meaning is accurately reflected. Synod Website Editor: I am with the Blantyre Synod Music Director to find out a little bit more for the synod website about him, his responsibilities and the future of music in Blantyre Synod! Firstly, Rev Mbeza, please tell us something about yourself, where you are from and your background. Rev Mbeza: I am from Mulanje District, Kambenje Village, Traditional Authority Nkanda, near Thuchila and Palombe. SWE: Aha! Thuchila. A very important place. Our family used to ascend to Thuchila Hut on Mulanje Mountain, it was our favourite place to stay on the mountain. RM: Is that so? In fact my mother's house overlooked the path up the mountain to Thuchila Hut. SWE: Tremendous. Tell us more about your family. RM: I am married with six children including one daughter and we have two grandchildren. SWE: And your educational background? RM: As a child I was at schools in Mulanje and Blantyre but I did teacher training at Montford TT in Chiradzulu. After teaching I studied theology at Zomba Theological College and at Fort Hare in South Africa, where I also completed a BA (Hons) in Music. SWE: Tell me something about your teaching years before you entered full time Christian work and study. RM: I taught at Makata Primary school, where I had earlier been a pupil, but I was very involved in Christian activities. I organised choirs for every class and the headteacher asked me to do many things related to that. I organised other teachers to give short expositions of the Word of God at assembly. otherwise I was teaching maths, geography, history and civics. SWE: What is on the Malawian history curriculum? RM: Malawian history and African history and also world history - mainly the world wars. SWE: Of course the world wars greatly affected Malawi. I know that WW1 interrupted and was in some ways the end of an era for the early days of mission in Malawi. But that is a interesting and big subject in itself. Instead of going down that road, tell us how you became a Christian? RM: I was brought up in the Christian faith. My parents were members of the church in the CCAP. I was confirmed as a full member in 1976. SWE: Now, tell us something about your call to the ministry at the time that you were still teaching? RM: The headteacher was asking me to invite evangelists to the school. He said that the Christian work was bringing people together in the school. I however felt as though I was growing spiritually and felt compelled to choose between teaching and serving God full-time. I chose full-time Christian work in 1990. SWE: What about your own direct involvement in evangelism prior to your call to the ministry? RM: I was going to the hospitals to pray for the sick and was involved already in organising evangelistic rallies with the presbytery. Once in the ministry and at evangelistic rallies I would play the accordion. This was unusual and generated interest prior to a speaker getting up to talk. SWE: When you felt the call to the ministry, what was your vision for what you wanted to do as a minister. Were there things you wanted to change? RM: I wanted to preach the Word of God so that many would come to know Christ as their Saviour. I also wanted people to be fed spiritually. SWE: Tell us about your theological education. 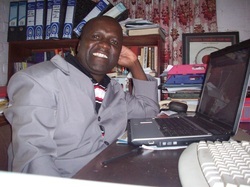 RM: First I studied at Zomba Theological College from 1991 to 1993. I did not go to Fort Hare in South Africa for another ten years after that. In between I served in the ministry in Chikwawa (on the East Bank of the Shire River) and in Chiradzulu, including a time as Presbytery Clerk. Rev, Prof. Joseph Hopkins helped with roofing for two churches during that time. SWE: Aha, the less visited East Bank of the Shire River beneath the towering escarpment. [Editors note: This is the area up from which David Livingstone and other early missionaries looked towards the 'Shire Highlands'.]. SWE: You were a long way north of The Elephant Marsh however? SWE: Getting back to your theological education, tell us about you and Fort Hare? RM: The synod felt a need for someone to be musically trained. The General Secretary, Rev David Gunya, did not want me to go without first achieving a certain certified level of competence within music before I left. Mr Chechamba helped with this and I achieved the necessary level. I studied for a BA majoring in music graduating in 2005 and completed my BA (Hons) in Music in 2006. RM: From 2006 I was a Luchenza CCAP in Thuchila Presbytery. SWE: Felt like returning home? RM: Yes, and then in 2009 was appointed Synod Music Director. SWE: Tell us something about your vision as Synod Music Director. RM: Having learned about indigenous music I wanted to incorporate it in church music. SWE: That is interesting. I know that when DC Scott was the head of Blantyre Mission in the late 1800's he had a vision that a truly 'African Christian Civilisation' would be built here, rather than having a 'European Christian Civilisation' being transplanted onto a different society and culture. As part of that he wanted to include local music and ways of doing things. He only wanted to block things that were fundamentally opposed to the Christian faith. Of course he was opposed by some. Is my understanding correct and do you share DC Scott's vision? RM: You are right. We want the two styles to grow together. The group dominating in the church is the traditional. There are hymns in church from the Scottish Mission and some of the tunes have been changed. We have taken local music and attached to the lyrics of the hymns translated by the Scots. There was a time when drums were not in use in the church. But they are now. The two styles ares going together. Some churches wish to maintain the traditional Scottish presbyterian style. Most blend the two but St Michael and All Angels separates the traditional service from the contemporary. SWE: Some people are worried about what is happening in contemporary services. RM: Yes, outside of the music side of things - things are happening in the contemporary style services which are questionable from a presbyterian viewpoint but more typical of a pentecostal style of service. SWE: What are your responsibilities? RM: To ensure that congregants are praising God in an orderly manner. To work with leaders from synod level right down to congregations on the best way of singing by using workshops, vocational courses, by recording music for them to listen to and to implement what is agreed at synod committee level. We are also teaching music notation as a skill as a way to earn a living. We make sure that the music materials should be available to congregants: hymn books. We compile hymns recorded from various choirs. We also organise choirs to come together for fellowship and to organise choir festivals. SWE: What is your current vision and what projects are being worked on? rooms, auditorium, open to whoever wishes to hire. to open the doors so that international people can come and work together. SWE: I know that you are looking to have a recording studio professional to come and work with you. Please tell us some more. RM: They should be fully qualified in order to train others. We want a studio engineer (six months ideally but according to their own constraints), a music producer (six months ideally but according to their own constraints), an electronic music programmer	(six months ideally but according to their own constraints) and someone who can do auditions of any kind of music, but mainly choirs. SWE: As well as being Synod Music Director, do you have your own congregations? RM: Yes, two. Manase CCAP, off the Chickwawa Road. We have one Sunday Service, Chichewa at 8am. The other is Misusa CCAP near Sunnyside which also has one Chichewa service, also at 8am. SWE: Thank you for your time Rev Mbeza.